Gondolin – The hidden city of the elves, surrounded by mountains, founded by King Turgon. The tragic and spectacular fall of this city was one of Tolkien’s earliest writings of Middle-earth. Valinor – The blessed home of the Valar and Maiar, the greater and lesser angels of Tolkien’s legendarium. 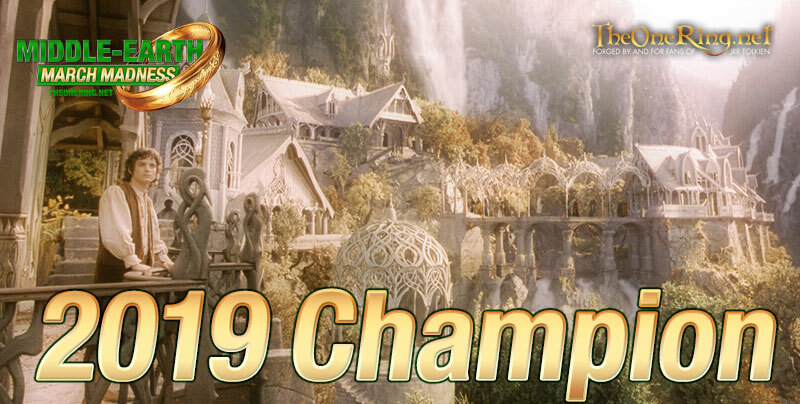 The elves were invited by the Valar to live with them in this land, but only some answered their call. Angband – The many-dungeoned fortress of Morgoth, the great enemy of all that is good in Middle-earth. Sauron was but a servant of Morgoth. This fortress was captured by the Valar in an early defeat of Morgoth, but they failed to destroy it utterly, allowing it to be repopulated over time. Thangorodrim – A trio of oppressively tall mountains, raised by Morgoth above Angband, to protect the latter. It was destroyed at the end of the first age in the War of Wrath. Halls of Mandos – The souls of dead elves and humans reside here, kept separate from each other for no good reason other than ‘that’s how it’s supposed to be’. Elves linger in the halls until they are ready to be housed in a new body; the souls of men will not linger here and go elsewhere, to a location not known to the Valar or elves, and only guessed at by humans. Nargothrond – A hidden underground elvish fortress ruled by Finrod. It was a place that had regular interaction between the races of Middle-earth: between the elves who lived there, the men Beren and Turin, who visited there and encouraged its people to fight Morgoth, the dwarves who helped expand its halls, and even the great dragon Glaurung! Numenor – A star-shaped large island, raised from the ocean by the deity of Tolkien’s stories, Illuvatar, as a gift to the humans who helped fight Morgoth in the First Age. Mighty were its people, and mighty was the envy of it and hatred for its people by Sauron, who was slowly regaining his strength as the Numenorian people began conquering the lands on the Western shores of Middle-earth. Tol Eressea – An island, near the shores of Valinor, that was home to many of the elves of Middle-earth who answered the call of the Valar to leave their homes for the Blessed Realm of Valinor. Like a giant pontoon, it was ferried back and forth between Middle-earth and Valinor to transport the elves who, at that early time, had not learned how to build ships. Menegroth – Yet another underground elven fortress (so much for elves being forest creatures loving to sleep under the stars!) – this time the home of Thingol and Melian in their realm of Doriath. Belegost – Along with Nogrod, one of two fortresses of the dwarves in the Blue Mountains, to the east of Beleriand, the land of Middle-earth with which the Silmarillion is concerned. After the War of Wrath, the Blue Mountains, just west of the Shire, were the only geographic feature of Beleriand that survived that war’s destruction. Sauron’s Dungeons – During the first age, Sauron was the chief lieutenant of Morgoth. During this, umm, interesting, time, he occupied a castle in a scary land, could transform into a bat at will, and had servants who were werewolves and vampires. 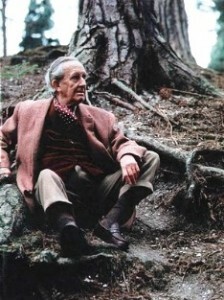 He also had many dungeons, with many famous occupants, including Beren, whom Luthien rescued. Nogrod – Along with Belegost, one of the two fortresses of the dwarves in the Blue Mountains of Middle-earth. From there was created Nauglamir, a necklace that played an important (and as always, tragic) part in the later history of the First Age. Vinyamar – an elvish settlement on the shores of Middle-earth, founded, and later abandoned, in the early part of the First Age. However, left there by the king who later founded Gondolin, were a set of armor and a sword, later found by a man who, with his son, changed the course of the world. Falas – A seaside elven kingdom ruled by Cirdan, the same one who built all the ships that ferried elves to Valinor during the Third Age (the pontoon-island of Tol Eressea having been firmly anchored down ages before). Hithlum – the land between the polar-ice of the Helcaraxe, and the land of Beleriand, where most of the First Age’s action occured. Hithlum was chilly and rainy, but crops grew there, and it was regularly under attack by Morgoth. Yes indeed, Hithlum was the fun capital of the First Age. Middle-earth Map March Madness starts now!! 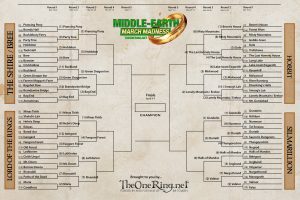 Middle-earth Map March Madness 2019 begins today! 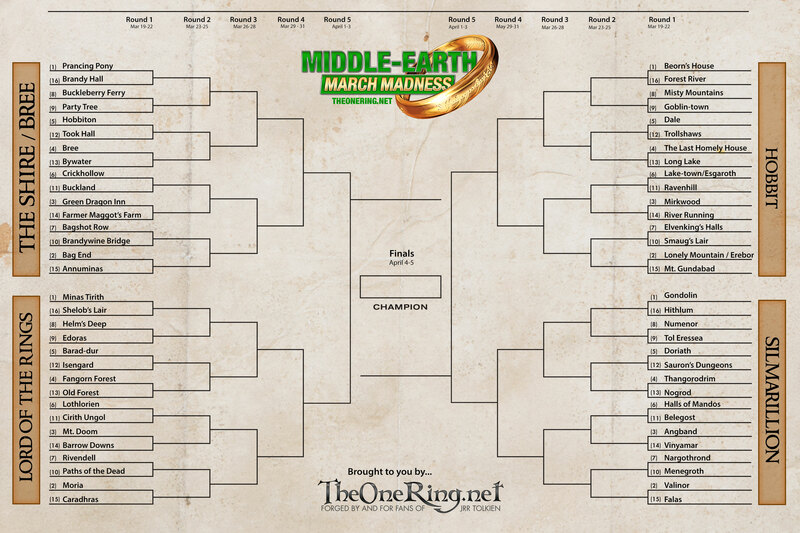 As promised, the four brackets for this year are all locations from Tolkien’s realm, divided into sites which appear in The Silmarillion, The Hobbit, The Lord of the Rings, and a fourth bracket just for the many wonderful spots in The Shire and Bree. All you have to do to take part is vote for your favourite in each of the pairings! 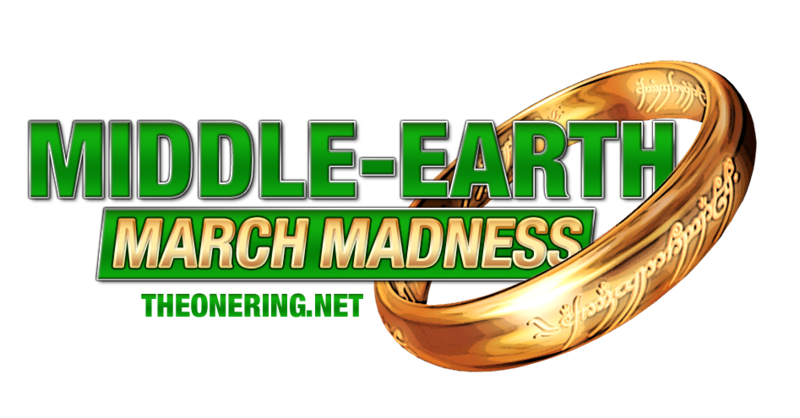 We start with 64 competitors; by next round we’ll be down to 32, then 16, and so on until we have a final showdown between the two locations which make it to the grand final. How you choose which way to vote for each duel is up to you; logic, chance or emotion can be your guide! 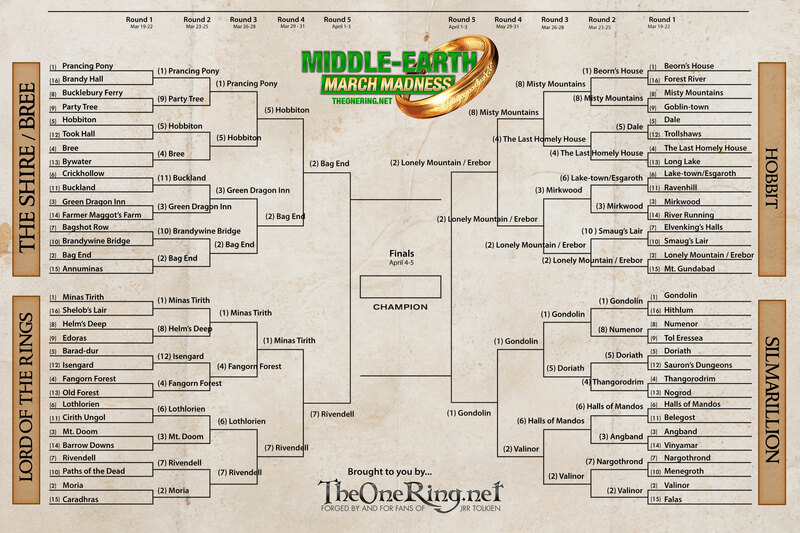 All that matters is that you cast your votes!